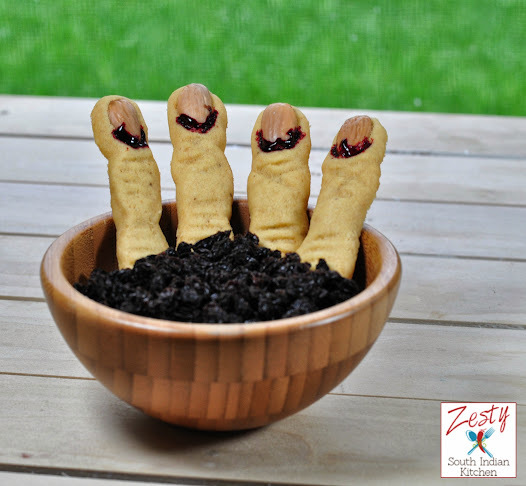 When I had made Nan Khatai , I had a little dough left and I thought I can make some spooky treats for my daughter. She was excited when I told her that I am going to make cookies, she was really helpful while making them and sat quietly watching me make it. However when the finished product was shown to her, she told me fingers are keep bleeding, so she doesn’t want it. You will be wondering what is keep bleeding, it is keep bleeding in love song by Leona Lewis. She loves it and would play it in Ipad, every chance she gets. She can only say keep bleeding from that song, so she always singing around that. She is also fan of Alde, and her favorite song is Rumor has it. She likes to sing it on her way to school as it is played in car from radio station along with Wheels in the bus goes round and round. However her brother is a fan of POM POM POM song from tamil movie Desingu Raja. Trust me he wants to play it in the Ipad almost 5 times a day. Just for fun I tweeted about this to music director of this Song Imman ,that you have a 22 month old fan who loves to play this song for 5 times day. I got immediate reply from him also. My daughter also had to undergo a few extraction and crowns, and had a 90 min work under general anesthetic. She did well and went right back to school the next day enough though she was visibly tired. At first I made witch finger, and used about tablespoon of dough, but then fingers expanded t a large size after baking, it was more like monster finger than a witch finger. So next time I made with ½ tablespoon dough, as Nan khatai dough has a little leavening agent. If you are using any other recipe try to use it about teaspoon of dough as they may have leavening in it. Since it is Nankhatai dough, Witch Fingers came out very delicate, you need to be careful handling them. Otherwise it will break into pieces. I also used blanched almonds for nails. After I finished baking I painted the finger nails with red gel food color. That is why my princess told me it is keep bleeding and she doesn’t want to eat it, however my boy was fine with it. He was happy to eat the witch fingers. May be once he grows up, and he realizes that it is spooky he may not eat it. 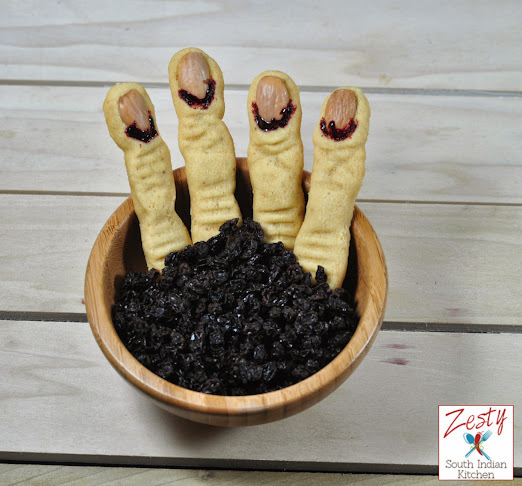 It is really tasty though, if you are looking for a tasty melt in your mouth witch fingers try this recipe. 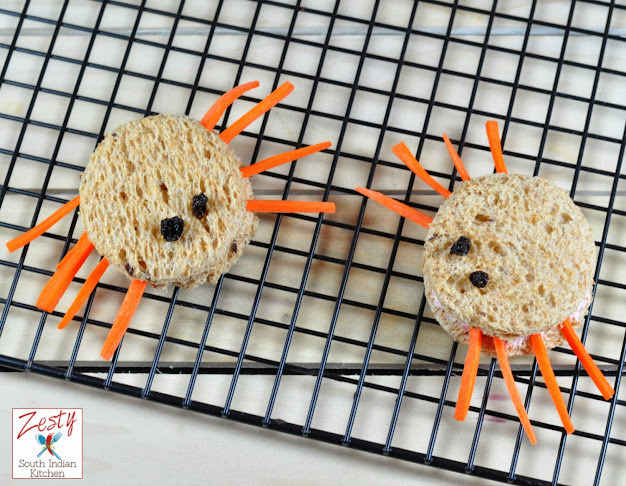 After the fingers, I was looking for an edible spooky sandwich and I found this very cute recipe for these spiders. For ingredients you need whole wheat multigrain bread, jam or peanut butter or cream cheese, and carrot or celery or pretzel sticks, you are good to go. For eyes you need raisins or currants, even black olives might work well. Since my daughter doesn’t want to touch witch fingers, I made her favorite strawberry cream cheese, carrot and whole wheat bread. This is easy if you have biscuit cutters, use it to cut out small rounds of 2 ½ inch and then apply cream cheese on one side of each slice and then between the slices stick thinly sliced carrots on both sides. My kids loved it. So if you are planning for Halloween parties go ahead and try this one. Kids will enjoy it for sure. 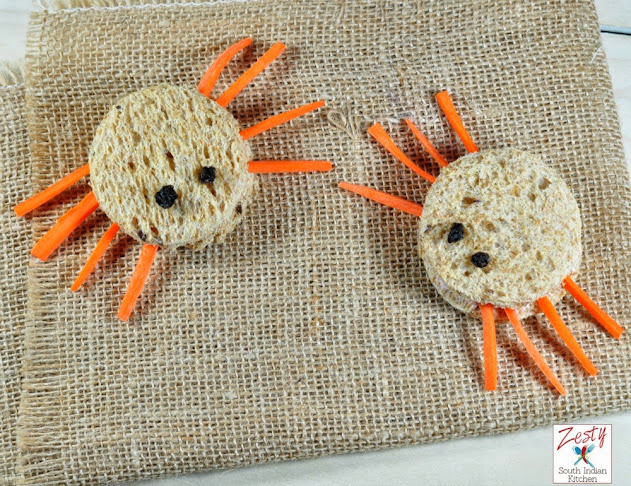 Cut out the spider bodies using a 2 1/2-inch cookie cutter to cut a circle from each slice of bread. Place the circles on a cutting board. Spread the cream cheese on one side the bread circles using a table knife. 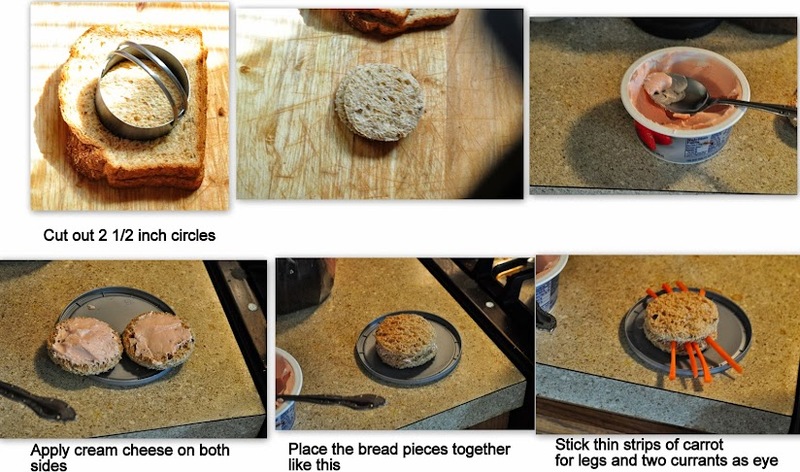 Place the cheese spread side on one each other and stick well so that bread will stay in one place. 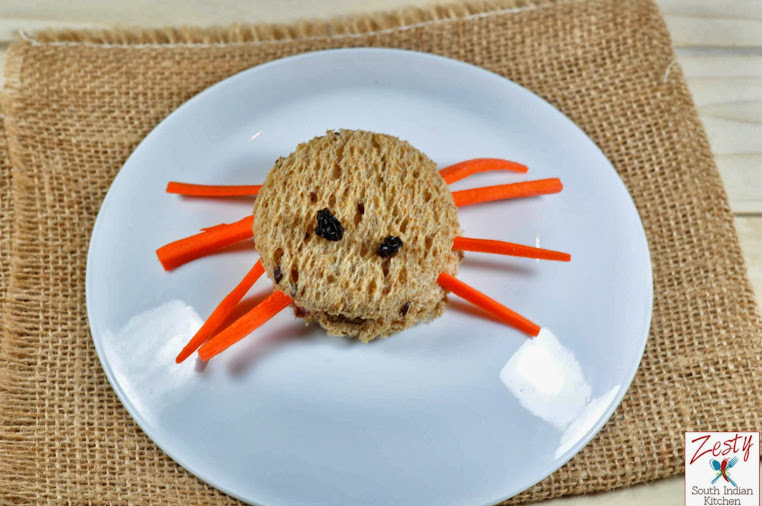 Place eight carrot sticks on the side of the bread circles for the spider legs. Place the remaining bread circles on top. Press two currants into each circle to be the eyes. If you wish you can draw a web on a paper plate with a black marker and place the spiders on the plate to serve. You can also serve the spiders on a round wire rack to resemble the spider web. Preheat oven to 300 degrees F (150 degrees C). Line the baking sheet with parchment paper and set aside. Remove dough from refrigerator in small amounts. Scoop about ½ tablespoon of at a time onto a piece of waxed paper. Use the waxed paper to roll the dough into a log of 6 inch length and ¾ inch wide, and then shape it into thin finger-shaped cookie. 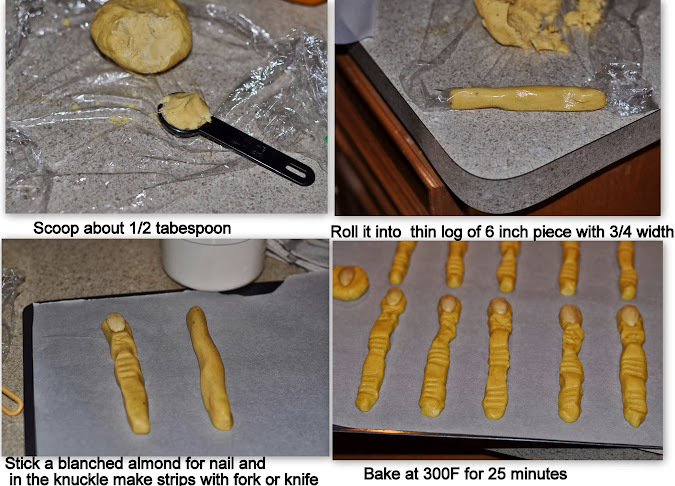 Press one almond into one end of each cookie to give the appearance of a long fingernail. Squeeze cookie near the tip and again near the center of each to give the impression of knuckles. You can also cut into the dough with a fork at the same points to help give a more finger-like appearance. Arrange the shaped cookies on the baking sheets. Bake in the preheated oven until the cookies are slightly golden in color, 25 minutes. Awesome .. Love the spiders ..simple and easy to make .. Figures are really spooky .. Check out the event running on my blog . Wow really spooky and very nicely made,… love the clicks…. Lovely clicks.Scary witch fingers.Really really scary. The fingers are spooky and so realistic Swati. Love the idea. The sandwiches are so adorable. Great tips for Halloween. Enjoy your sunday. 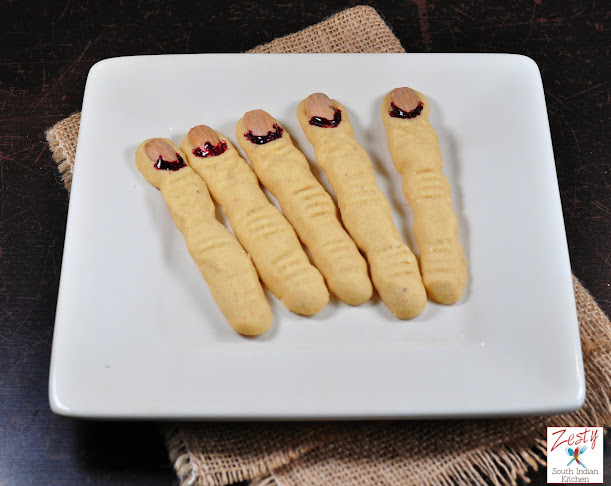 Spooky yet wonderful fingers and spider….lovely preparation! Wonder halloween treats, looks spooky. 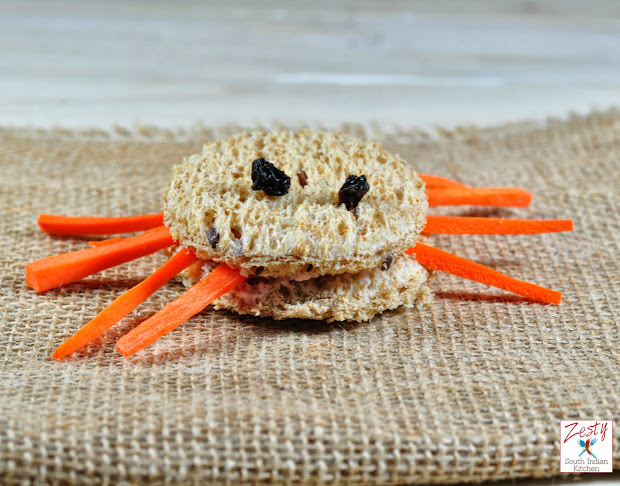 Love the Spider Sandwich… In general I am not so fond of witch fingers.. But Gosh, those really look like witch fingers… Scary! Scary fingers, just up to the purpose of it! Amazing! The fingers are pretty incredible. They look real! Pretty creepy but so cute for Halloween! FUN! Yes for kids I made it. Perfectly made,kids will love this Halloween treat,yaa it is bleeding of course. Make a batch for Nidhi that is not bleeding. Looks great , Beautiful clicks , U r really very creative ! Yes she didn’t want to eat it, but son happy to eat though. The fingers look really very spooky, especially with the markings with the fork, and the spiders are sort of cute Swathi.. Yes fork did better job than knife. Thanks Reni, Yes I finally did it. These are so creative Swathi! The fingers are very realistic! You did a great job on them. I can see why she didn’t want to eat them. Bet they tasted good though. The spiders are cute too! Me ha encantado el sandwuis de araña y esos dedos de miedo igual me los como jejje muy buenos,abrazos. cute luking sandwich n cookies.ur excellent in baking dear…creative idea..